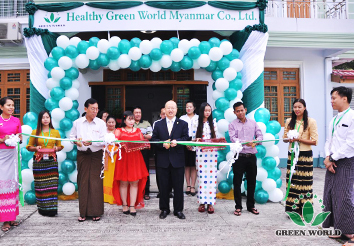 On January 12, 2019, a grand opening ceremony of Green World Myanmar Branch was held in Yangon city. Former Deputy Director of the Myanmar FDA (Food and Drug Administration), Incumbent District Head of Kamayaut (1st Quarter) in Yangon, Senior Agent Mr. U Myint Swe, Ms. Daisy, Excellent Overseas Lecturer of Green World International Business School and other leaders and distinguished guests all attended and presented gifts. Green world global branches have also sent congratulatory messages to celebrate the opening of the Myanmar branch, jointly witnessing the important historical moment of the establishment of another new milestone of Green World's global business map. Before the ceremony, five senior Buddhist monks from Myanmar were specially invited to pray for the company. 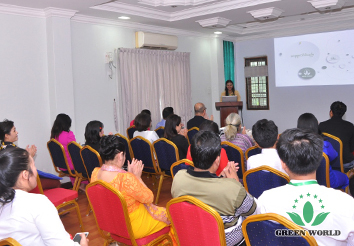 The distinguished guests all chanted devoutly and wished Green World Myanmar Branch a prosperous future. At 8:58 in the morning, all guests gathered in front of the new office building, and the opening ceremony started with the host's wonderful opening, a very enthusiastic and lively scene. Former Deputy Director of the Myanmar FDA and Incumbent District Head of Kamayaut (1st Quarter) in Yangon then extended congratulations respectively, and expressed their expectation for the future development of the Green World Myanmar Branch. Mr. Jiang Zhiyu, General Manager of the Myanmar Branch, delivered the opening ceremony address in a warm applause, elaborating the 25-year development history of Green World, emphasizing the enterprise spirit and core values that the group has always upheld, and looking forward to the future development of the Green World business in Myanmar with great expectation. 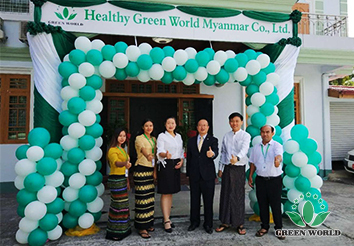 Mr. Jiang Zhiyu, General Manager of the Myanmar Branch, Former Deputy Director of the Myanmar FDA and Current District Head of Kamayaut (1st Quarter) in Yangon were invited to attend the ribbon-cutting ceremony and posed for pictures. 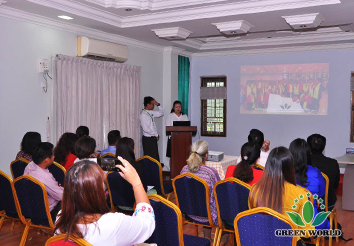 In the third part of the opening ceremony, Ms. Daisy, Excellent Overseas Lecturer of Green World International Business School, explained to more than 30 senior leaders the principles, functions and market needs of the products were about to be launched to current Myanmar market, and the product demonstration of Tourmaline Series and the Multi-functional Anion Ozone Machine was carried out, with results astonishing the audience. 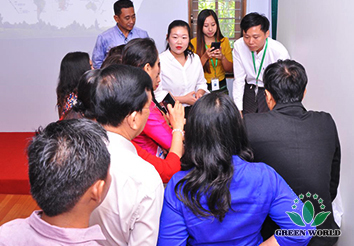 Ms. Daisy, Excellent Overseas Lecturer of Green World International Business School, explaining to market leaders the products were about to be launched to the current Myanmar market. 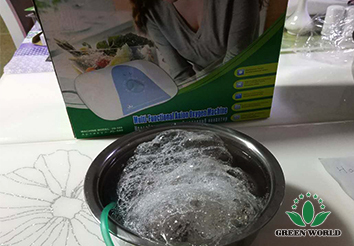 After 25 years of development, Green World has stayed true to the mission and forged ahead bravely through all difficulties. The establishment of Myanmar Branch is a witness to the strength of the company and another milestone. 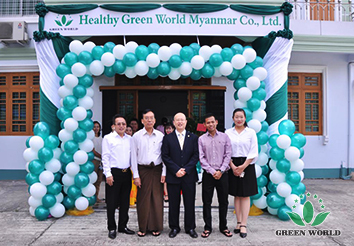 With the increasing health awareness of the Burmese, Green World will usher in a historic time with wider opportunities, and Myanmar will become another strategic market in the Green World Southeast Asia region!